LOS ANGELES ... Mar. 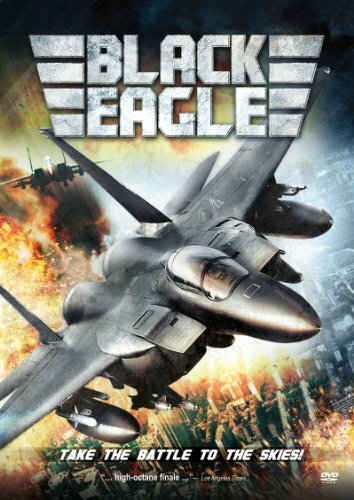 1, 2013 - For Immediate Release - Two pilots must set aside their differences and lead the way to rescue a comrade and prevent war in the action-packed drama Black Eagle , flying onto DVD March 12 from CJ Entertainment America. After pulling a dangerous, daredevil stunt at an air show, hotshot elite Air Force pilot Tae-hun (Jung Ji-hoon, aka "Rain," Ninja Assassin, Speed Racer) is kicked off the military's top-notch Black Eagle air team and demoted into combat. Arriving at his new unit, the talented but reckless fighter is quickly popular with the majority of the squad, even sparking a heated romance with the lovely Se-yeong, the wing's best technician, whose faulty hearing is the only thing keeping her out of the air. But Tae-hun's brash ways soon cause tension with the unit's own ace top gun, the strait-laced Cheol-hui (Yu Jun-sang, In Another Country, The Day He Arrives). When a North Korean MIG fighter enters their air space, a reconnaissance mission erupts into a fierce dogfight, leaving one team member dead and another missing. Now, with just minutes to pull off the biggest airborne mission in history, they must set aside their differences and lead the way to rescue their comrade and prevent war. Black Eagle is presented in widescreen (aspect ratio: 2.35:1) and 5.1 Dolby Digital sound with English dub and subtitles. Special features include "Sortie's Ready! 500 Days of Filming," "Pilot G-Force Test" and "Characters" featurettes; behind-the-scenes; outtakes and trailers. Launched in 2005, CJ Entertainment America (CJ Ent.Am) is the U.S. arm of Asia's premier entertainment company and Korea's #1 filmmaker and distributor, CJ Entertainment & Media (CJ E&M). Since 1995, CJ E&M has provided original, award-winning content - across an array of genres, including drama, comedy, action, sci-fi/horror and special interest - for theatrical, television, DVD, digital download, interactive game publishing/portals and music. A prominent investor in entertainment co-ventures in overseas markets (including 1492 Pictures, DreamWorks and IMAX in the U.S.), CJ E&M also develops and operates 200 premium multiplex theater sites under the CGV Cinemas banner (including a flagship site in Los Angeles) and is a leading concert promoter, helping establish "K-pop" as a successful world music genre. The cornerstone of the Korean entertainment industry ... boasting the country's largest and most significant library, with hundreds of films - CJ E&M is also a singular presence throughout Asia, Europe and in the States and a key force in popularizing contemporary Korean and Pan-Asian cinema around the world. Top films include The Man From Nowhere; The Good, the Bad, the Weird; A Bittersweet Life; Joint Security Area; and the Vengeance trilogy, to name a few. Visit us online at: "http://www.cjent.co.kr/eng" (English) or "http://www.cjent.co.kr"" (Korean).